Fig. 3.8 Several forms of left ventricular outflow tract obstruction. Aortic stenosis is obstruction to systolic left ventricular outflow across the aortic valve. Symptoms appear when the valve orifice decreases to <1 cm2 (normal orifice is 3 cm2 ). The stenosis is considered severe when the orifice is <0.5 cm2 /m2 or the pressure gradient is 50 mm Hg or higher. Congenital aortic valve stenosis develops progressively because of turbulent blood flow through a congenitally abnormal (usually bicuspid) aortic valve. Most congenitally abnormal aortic valves occur in men and will calcify later in life. Rheumatic fever results in progressive fusion, thickening and calcification of a previously normal three-cusped aortic valve. In rheumatic heart disease the aortic valve is affected in about 40% of cases and there is usually associated mitral valve disease. Calcific valvular disease is the commonest cause of aortic stenosis and mainly occurs in the elderly. This is an inflammatory process involving macrophages and T lymphocytes with initially thickening of the subendothelium with adjacent fibrosis. The lesions contain lipoproteins which calcify, increasing leaflet stiffness and reducing systolic opening. * subvalvular aortic stenosis - a congenital condition in which a fibrous ridge or diaphragm is situated immediately below the aortic valve. Clinical Features. 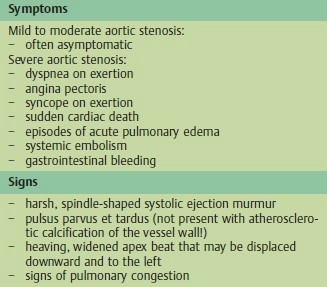 The most common symptoms of aortic stenosis are listed in Tab. 16. The presence of symptoms is usually an indicator of severe stenosis. Once symptoms have appeared, life expectancy falls dramatically and generally is less than five years. When heart failure supervenes, the average survival time without operative treatment is less than two years. Dyspnea is often precipitated by diseases or conditions that hamper diastolic filling. Typical examples are tachycardia and atrial fibrillation. Some 75% of patients with severe aortic stenosis complain of angina pectoris. Approximately 50% of these patients will have normal coronary arteries. Syncope is often caused by decreased cerebral blood flow but may also be triggered by an inadequate baroreceptor response or intermittent arrhythmias. Clouding of vision and dizziness are symptoms of exercise-induced hypotension. In rare cases aortic stenosis may be manifested by the systemic embolization of microthrombi or calcium fragments from the valve. Gastrointestinal bleeding may also be a sign of aortic stenosis. Angiodysplasia of the colon is common in patients with aortic stenosis. The typical findings are summarized in Tab. 16. A spindle-shaped systolic ejection murmur is the most important clinical sign of aortic stenosis (Fig. 3.9). The ejection murmur is harsh and loud over the Erb point. Generally, the more severe the stenosis, the longer and more intense is the murmur. It radiates to the carotid arteries and is also transmitted toward the cardiac apex, where it assumes a distinctly musical quality. 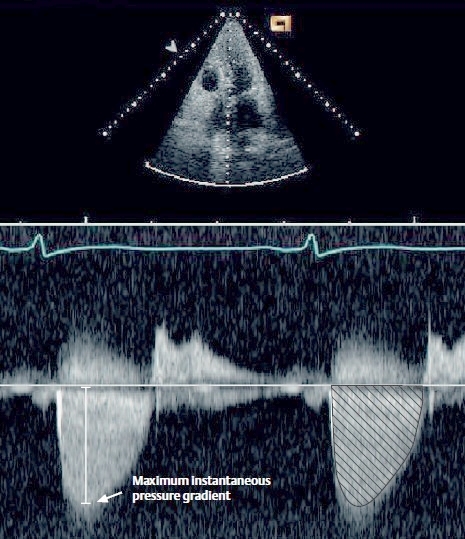 This transmitted murmur is difficult to distinguish from concomitant mitral insufficiency. The second heart sound in aortic stenosis may be very soft, and it may be virtually absent in severe aortic stenosis. The forceful atrial contraction associated with a stiffened left ventricle produces a fourth heart sound. If the valves are immobile due to valvular aortic stenosis, the systolic murmur begins with an ejection click. Frequently a thrill is palpable at the sternal border and in the jugular fossa. Fig. 3.10 Pressure curves in aortic stenosis. Chart compares the left ventricular pressure (LV) with the simultaneously measured aortic pressure (Ao). The pressure rise in the aorta is delayed (“cockscomb” pattern), and a significant pressure gradient is present. The pressure gradient is measured invasively from peak to peak, and the mean pressure gradient is calculated. Doppler echocardiography measures the maximal instantaneous pressure gradient. Thus, when the peak pressure gradient is determined invasively and by echocardiography they are always different, but the mean pressure gradient is identical in both methods. The pulse rise is delayed in the presence of aortic stenosis. The pressure curve shows a cockscomb pattern (Fig. 3.10), which is responsible for the typical pulsus parvus et tardus (“small and late”). The apex beat is widened and heaving. In patients with left ventricular dilatation, the apex beat is displaced laterally downward (Fig. 3.11). • Aortic stenosis is the most common valve lesion in adults in Western countries. • Calcific stenosis (most common cause in patients >60 yr old) occurs in 75% of patients. * ECG: (Fig. 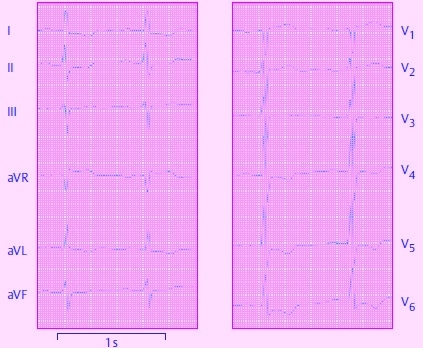 3.12) the ECG generally shows signs of left ventricular hypertrophy. ST-segment depression, also called “left ventricular strain,” is found in cases of severe hypertrophy. * Chest radiograph: a chest radiograph taken in the lateral position will usually show calcifications in the middle third of the cardiac silhouette. 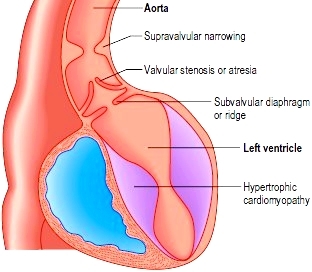 The left ventricle appears rounded due to concentric hypertrophy (see Fig. 3.11). The heart generally displays a normal size. If cardiomegaly is present, the patient will manifest signs of left ventricular dysfunction or concomitant aortic insufficiency. * Echocardiography: echocardiography will demonstrate a severely altered aortic valve with calcifications. The degree of left ventricular hypertrophy can be determined, as can the degree of asymmetrical septal hypertrophy, which is frequently present. It is common to find poststenotic dilatation of the aorta. 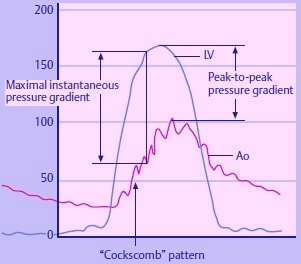 Doppler echocardiography can measure the peak pressure gradient (instantaneous peak pressure gradient, Fig. 3.13). This gradient is higher than the peak pressure gradient between the aorta and left ventricle measured by cardiac catheterization (see Fig. 3.10). The mean pressure gradient can be calculated. Planimetry can also be used in echocardiography to estimate the opening area of the aortic valve. A mean pressure gradient higher than 50mmHg and an aortic valve opening area less than 0.8 cm2 indicate severe aortic stenosis. It should be noted that as left ventricular function declines, the pressure gradient also decreases and that even with severe aortic stenosis, the mean pressure gradient may measure less than 50 mmHg. * Cardiac catheterization: aortic stenosis is usually correctly diagnosed based on good-quality echocardiograms. In equivocal cases, however, the left ventricle should be catheterized through the stenotic valve so that the pressure gradient can be measured see Fig. 3.10). Cardiac catheterization is also an important preoperative study for detecting concomitant coronary heart disease. • Aortic sclerosis. 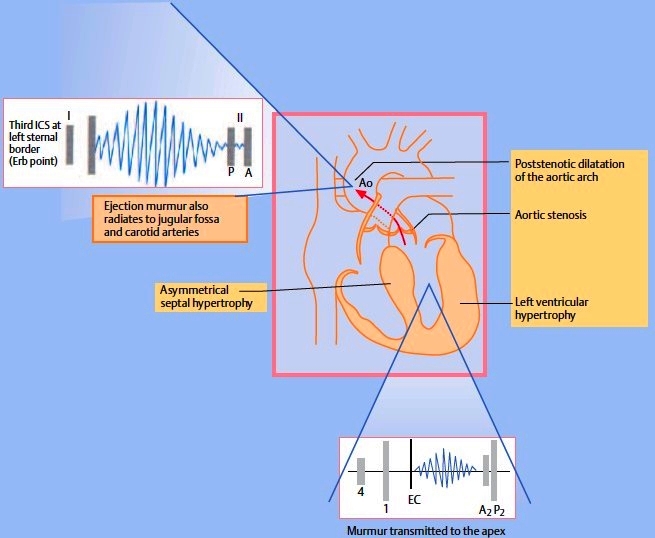 Aortic stenosis is distinguished from aortic sclerosis by the degree of valve impairment. In aortic sclerosis, the valve leaflets are abnormally thickened but obstruction to outflow is minimal. • Doppler echocardiography: thickening of the left ventricular wall; if the patient has valvular calcifications, multiple echos may be seen from within the aortic root and there is poor separation of the aortic cusps during systole. Gradient across the valve can be estimated but is less precise than with cardiac catheterization. • Cardiac catheterization: indicated in symptomatic patients; it confirms the diagnosis and estimates the severity of the disease by measuring the gradient across the valve, allowing calculation of the valve area. It also detects coexisting coronary artery stenosis that may need bypass at the same time as aortic valve replacement. Indications for Operative Treatment. Operative treatment is indicated in all symptomatic patients with severe aortic stenosis. It is appropriate in asymptomatic patients who have left ventricular dysfunction or exercise-induced hypotension. • Strenuous activity should be avoided. • Sodium restriction is needed if CHF is present. Fig. 3.11 Aortic valve defects: configuration of the heart in the chest radiograph; PA view (left column) and lateral view (right column). 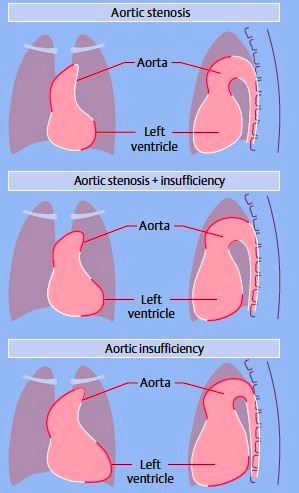 With aortic stenosis the left ventricle is not enlarged but has a rounded apex. The ascending aorta shows poststenotic dilatation. With aortic insufficiency, the left ventricle and the aorta are markedly dilated and elongated. With a combined aortic defect, enlargement of the left ventricle is less pronounced than with aortic insufficiency alone. The ascending aorta is dilated and moderately elongated. Fig. 3.12 ECG in aortic stenosis shows left axis deviation with a pronounced repolarization abnormality in the left precordial lead and in I and aVL (strain). • Diuretics and sodium restriction are needed if CHF is present; digoxin is used only to control rate of atrial fibrillation. • ACE inhibitors are relatively contraindicated. • Calcium channel blocker verapamil may be useful only to control rate of atrial fibrillation. • Valve replacement is the treatment of choice in symptomatic patients because the 5-yr mortality rate after onset of symptoms is extremely high, even with optimal medical therapy; valve replacement is indicated if cardiac catheterization establishes a pressure gradient >50 mm Hg and valve area <1 cm2 . • Balloon aortic valvotomy for adult acquired aortic stenosis is useful only for palliation. Fig. 3.13 Aortic stenosis: measurement of the pressure gradient by Doppler echocardiography. The maximum velocity determined by Doppler echocardiography is 4 m/s. A maximum instantaneous pressure gradient of 64 mmHg is calculated from the Bernoulli equation (4 x 42 = 64 mmHg). The mean pressure gradient is determined by calculating the mean pressure over the entire Doppler signal (shaded area). • 15% to 20% of patients with severe aortic stenosis die before age 20 yr.
• The 5-yr survival rate in adults is 40%. • The average duration of symptoms before death is as follows: angina, 60 mo; syncope, 36 mo; CHF, 24 mo. • About 75% of patients with symp-tomatic aortic stenosis will be dead 3 yr after onset of symptoms unless the aortic valve is replaced.